adopt high-quality aluminum alloy pipes, which surface is oxidized. There are many colors and patterns available. 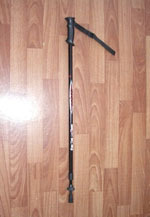 Main specifications are two-section, three-section, four-section flexible and adjustable aluminum alloy alpenstocks, and carbon ski poles. Length can be regulated at will.